Top left: photo by Angeleen Olson. Bottom left: the underside of a black katy chiton with a limpet attached. 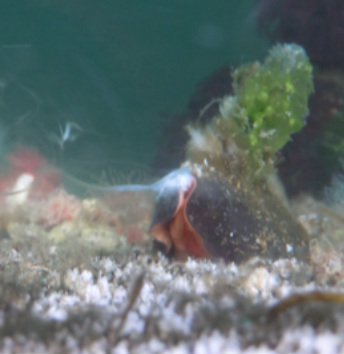 This is not a predator-prey relationship caught on camera; likely the chiton was moving over the limpet. Photo by Katy Fulton. Right: at least 8 black katy chitons nestled among giant acorn barnacles (themselves covered in thatched barnacles), anemones, sea snails, and patches of purple encrusting sponge. Photo by Sara Wickham. A distinguishing feature of this chiton is the black leathery look of the thick girdle tissue surrounding the plates on its dorsal side. While this tissue can vary to dark brown it maintains the same leathery look and texture. The 8 plates are white, though they may appear grey or brown from wear and tear. Underneath the plates and black tissue the mantle and foot are pinkish-red or orange-red. This chiton can get up to 15 cm long. The black katy chiton can be found in the rocky intertidal and subtidal of exposed shores, where it is experiences heavy wave action and strong currents. This species is found along the west coast of North America from Alaska to southern California, as well as off the coast of the Kamchatka Peninsula in Russia. 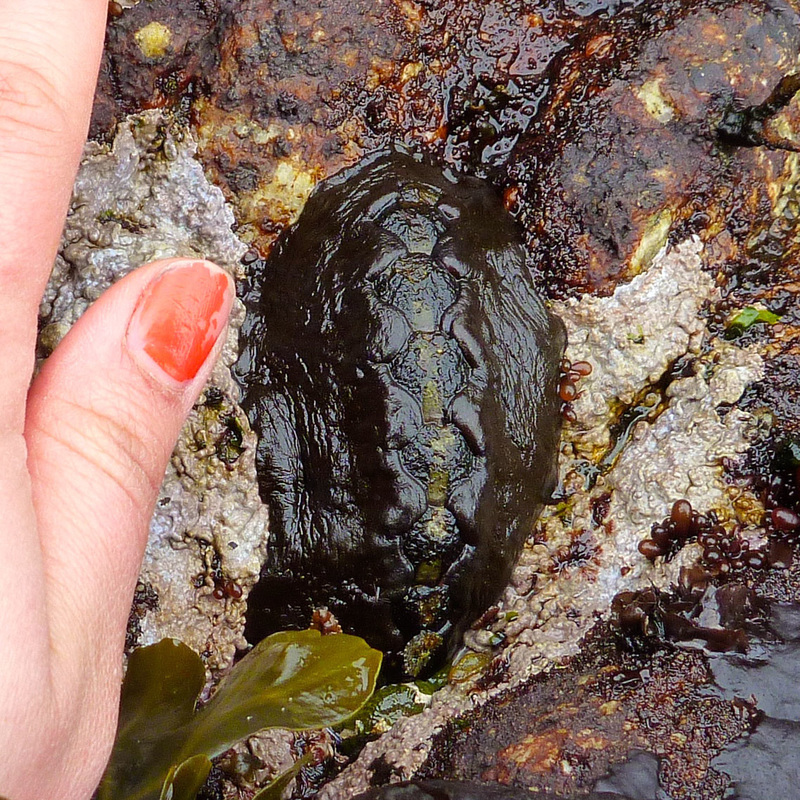 This chiton was a traditional food source for coastal First Nations groups. As such, it became the subject of legends for many First Nations groups, such as the Haida and the Manhousat nation from Vancouver Island. Both legends speak of the transformation of other creatures into the black katy chiton. For the Haida it was a black beetle, and for the Manhousat it was a terrestrial slug. 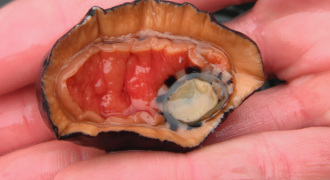 The black katy chiton is still harvested for subsistence food in some regions. "Sea prune" is a name used by some First Nations groups; another name for this species is "small Chinese slippers." ​Shell plates can be repaired when damaged, with full repair occurring within just a few weeks. 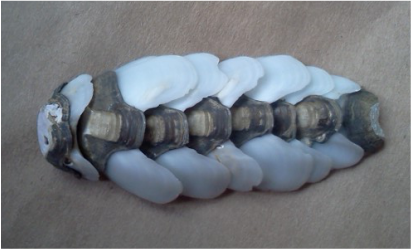 Left: the eight shell plates of a chiton, left clean after a biology dissection lab. Photo by Kelly Fretwell. Right: a black katy chiton lifts its mantle and releases a milky white substance suspected to be sperm. Photo by Rebecca Segal. Katherina (Black Katy Chiton). 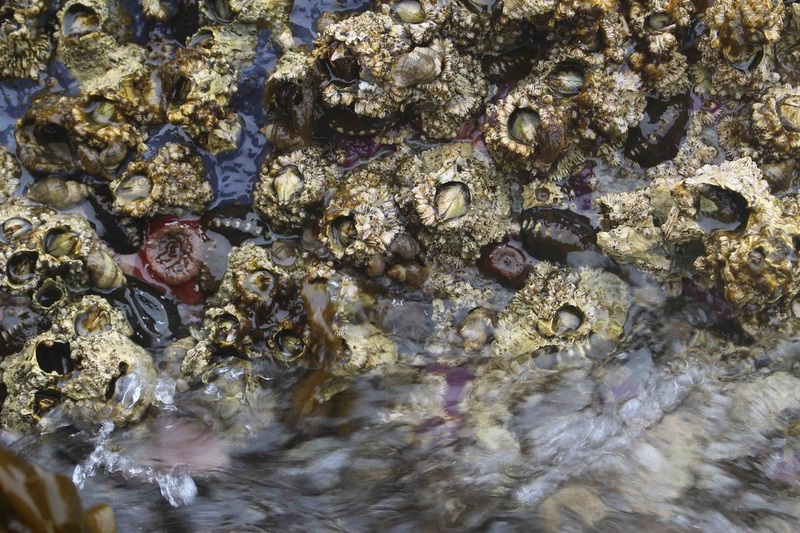 Pacific Rocky Intertidal Monitoring: Trends and Synthesis. Ecology and Evolutionary Biology, University of California Santa Cruz. Accessed 15/02/2015.